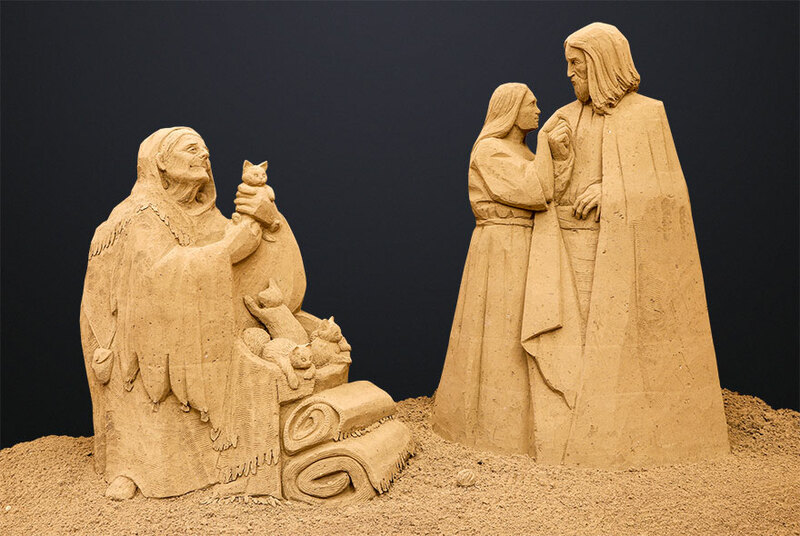 Since 2002, thanks to a fortuitous intuition by its municipal administration, the town of Jesolo has been celebrating the magic of Christmas through a work of great charm and appeal that delights thousands of visitors from around the world: the Sand Nativity. Its creation each year involves some of the best international sand sculptors, masters in bringing the authentic Christmas spirit to life, through an art form that rekindles childhood memories in the spectators. Each year, it has a theme of relevance to contemporary society and, since 2004, it has also embraced solidarity initiatives: to date, 24 locations in 4 continents have benefited from projects implemented thanks to the contribution of the Sand Nativity visitors. In the wake of its success, and thanks to the collaboration of the Patriarchate of Venice, this year the Sand Nativity is taking off for an extraordinary destination: for the 2018 edition, a spectacular sand nativity will be created in the heart of Christendom, the magnificent St. Peter’s Square in Rome. The nativity scene will seal next Christmas in an atmosphere filled with emotion and significance. The star of Bethlehem is already on its way!